Whew! I sure did cut it close with getting this recipe done in time! I attempted to make it last weekend, figuring they were calling for snow (grrr!) but right in the middle of making it, the power went out for 5 HOURS! Of course I used the last of the carrots and potatoes on the original recipe so I couldn’t make it again until I bought more. For the Secret Recipe Club this month I was assigned Holly’s blog PheMOMenon. Considering she’s the mother of three and wife to a skydiver, I’d definitely consider her a phenomenal mom! I can’t imagine what type of interesting stuff goes on at her house! 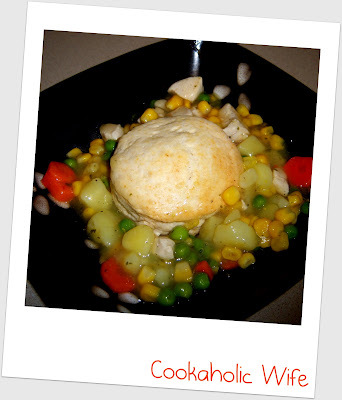 When I first looked through her blog, I immediately found some recipes I wanted to make. I originally planned to make them all and have them all post this week, but that just didn’t turn out. I’m pretty sad I didn’t get a chance to try her caramel apple rice pudding, chocolate biscotti or ciabatta bread but hey, at least they’re on my list to make in the future! For months, Tom has asked me to make chicken pot pie. Honestly, I didn’t think I would like it so I kept putting it off and telling him I forgot about if after he saw the menu for the week. So when I found chicken pot pie on Holly’s blog, I knew it was just the push I needed to finally make it and to make Tom happy. 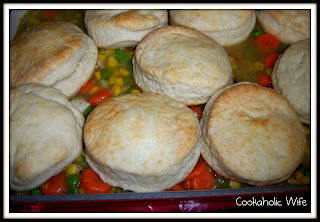 Of course when Tom saw the recipe called for biscuits, not a pie crust he said it wouldn’t be real chicken pot pie. I stuck my tongue out at him, rolled my eyes smiled and told him that he’d get over it. 1. Preheat the oven to 400. In a medium saucepan, add the potatoes and cover with salt. Add a pinch of salt and bring to a boil over high heat. Cook the potatoes for 10-15 minutes or until fork tender. 2. Drain the potatoes, reserving at least 2 cups of the cooking water. Transfer the potatoes to a 9×13 baking dish and spread evenly in the dish. 3. In another medium saucepan, add the chicken stock and 1 cup of water. Bring to a boil and then add the chicken pieces. Cook for 10 minutes. Using a slotted spoon, spread the chicken over the potatoes in the baking dish. 4. Pour the reserved potato water into the saucepan with chicken cooking liquid. Heat on low. 5. In another medium saucepan (or rinse and use the one from the potatoes), add the carrots and cover with water. Bring to a boil and cook for 5-7 minutes. Add the canned corn and frozen peas and add more water to cover if necessary. Bring back to a boil and continue to cook for 5-7 minutes more or until the carrots are fork tender but not mushy. Drain all liquid and spread the vegetable mixture on top of the chicken and potatoes in the baking dish. 6. Increase the heat of the reserved cooking liquid to high and add the chicken bullion cube. Whisk until it has dissolved. In a small bowl, whisk together the cornstarch and remaining 1/4 cup of water until a slurry forms. Once the chicken liquid is boiling, pour in the cornstarch/water mixture, whisking constantly. 7. Season with parsley, salt and pepper. Reduce the heat to low and let simmer for 5 minutes. The mixture should thicken into a gravy. 8. Pour the gravy into the baking dish, spreading it around to make sure everything is coated. Place the biscuits on top. 9. Place the baking dish on a foil-lined baking sheet (in case it bubbles over) and bake for 10-12 minutes, or until the mixture is bubbly and the biscuits are golden brown. 10. Allow to rest for 5 minutes before serving. I needed to get some homework done so I ate dinner in another room from Tom. When I came out to put my plate in the sink, he said “You can make that again.” I looked at the dish and all that was left was a biscuit and about a tablespoon of vegetables. I think that explains just how much we liked the dish! So much for him not wanting it with biscuits! And so much for me having leftovers for lunch the next day. I was really looking forward to that! I guess I’ll just have to make it again.